What a horrible reputation the ringnecked pheasant has: tough, wiry, tasteless, dry. If only those who had shot and cooked that prize bird (pheasants in days of old were only available in Europe to the conquering Romans who brought it from Asia and their descendants who became the rulers of Europe west of the Rhine), had properly applied aging. Good game bird cooking all starts in the field, and carries through in the days before a bird is either cooked or put in the freezer for a later date. 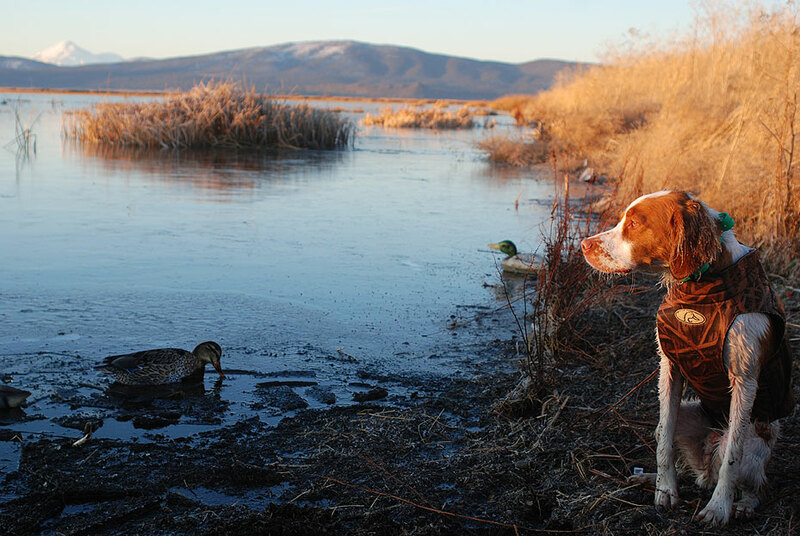 How long, was the question I put to my new hunting friend and writer, Hank Shaw of Hunter Angler Gardener Cook. 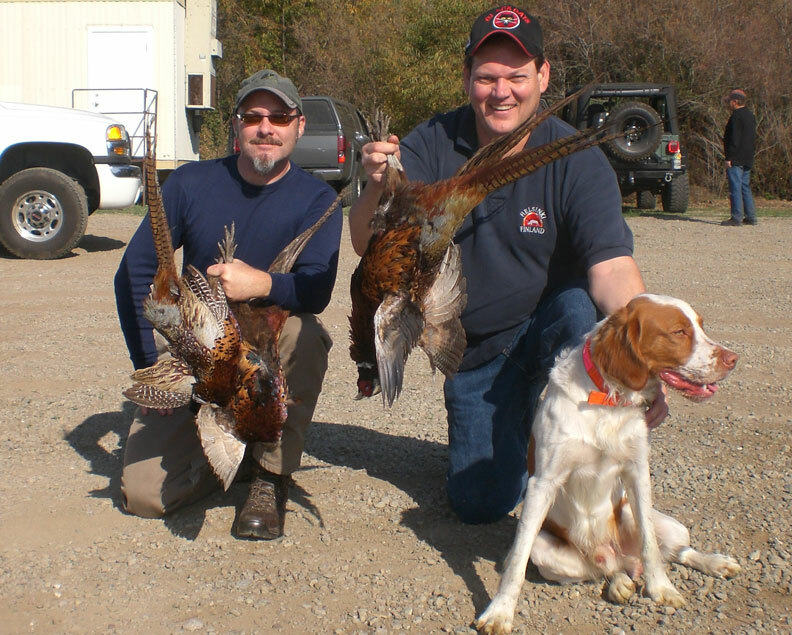 Hank Shaw and Cork Graham along with Ziggy after a successful pheasant opener. 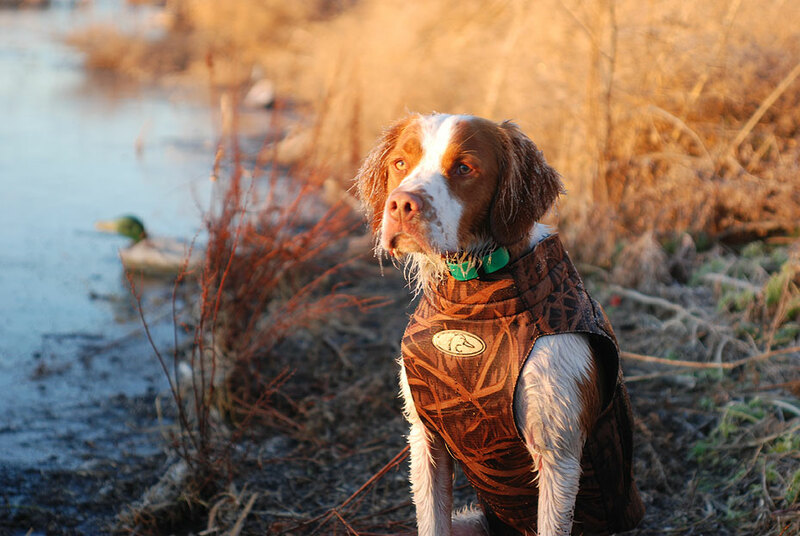 His suggestion was three to four days for a bird club pheasant, that’s basically a chicken that has been getting fast and sassy on a remote feeding system with poultry feed, as was available to us on our first hunt together at the Stockton Sportmen’s Club. For a wild bird, Shaw’s suggestion was seven days. This is often the recommendation used in Europe, especially the UK. Whether you talk to culinary expert Hank Shaw, or one of those cooking writers we both admire, like British writer Clarissa Dickson Wright , you can’t go wrong with aging your bird–whether two days, three days or until the head separates from the body. 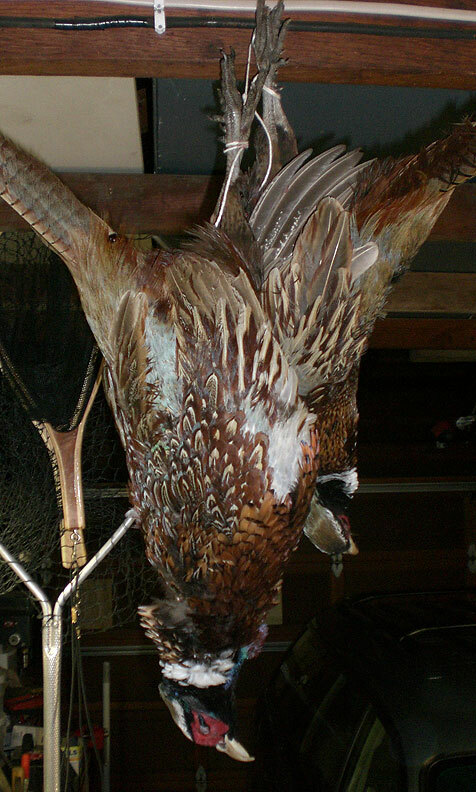 Yes, in traditional British bird aging, pheasants used to hang until it became so rotten it fell to the ground. When I first moved from combat journalism to outdoor writing, as the outdoors columnist for the last large family-owned newspaper in the San Francisco Bay Area, The Times of San Mateo in 1994 (It was eaten up the ANG /Denver-based MediaNews Group conglomerate in 1997 [renamed The San Mateo Times], along with the Oakland Tribune, Alameda Star and a number of other Bay Area papers [you’ll notice the columnists and writers are the same for all those papers]–All they wanted were the printers and real estate. Within a month, all journalists got their pink slips, if they weren’t already looking for more secure pastures…so much for honest local coverage; sadly, this is the way of The Press in the New Millenium: Thank God for the Internet! 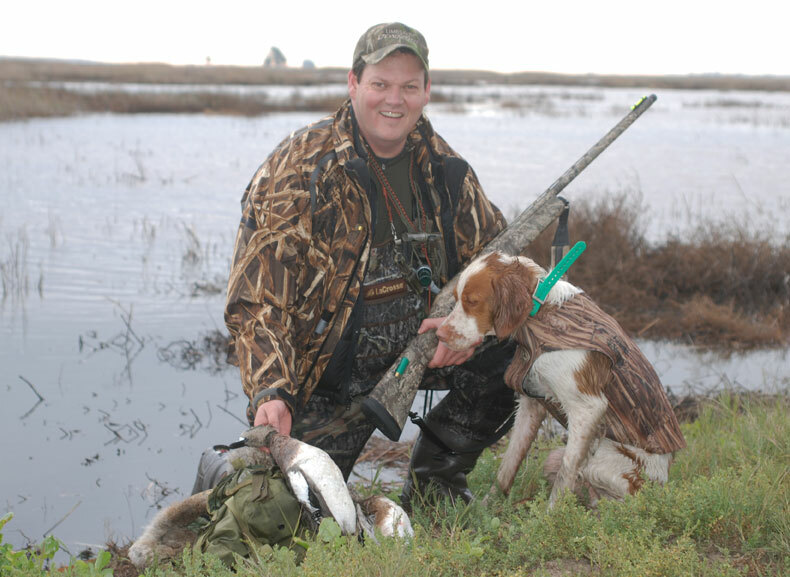 ), I was invited to the Gabilan Valley Sportsmans Club to hunt pheasants for an article. My Chesapeake Bay retriever had his first chance at pheasants and we both had a phenomenal time. As we were leaving, the owner recommended that we hang our birds. The suggestion was to hang them by the long tail feathers. Depending on how many days and the temperature, the pheasant would fall, indicating that it was ready to pluck and cook or put in the freezer. Personally, I prefer to eviscerate all my game and fish within moments of the kill. It cools the game quickly, which in the Sunshine Land of California is a priority, and more importantly removes all the body fluids that begin seeping into the cavity. Microscopically, body organs are actually very porous. It’s almost like a sieve. When the body is alive, those organ membranes are vibrant, contracting and expanding to hold or release fluids, as the body needs. When the body dies and the autonomic nervous system no longer controls those actions and fluids that taint meat like urine, stomach acid and bile, those fluids begin a slow release. It’s the immediate killing, bleeding and gutting of the trout, that I’ve caught or taught others to catch and prepare for the table, that draws the compliments for their taste. On the other hand, pheasants, along with waterfowl, can often be improved by leaving the innards in during the aging process. You simply hang them whole up in a cool, airy place. This is Hank Shaw’s preferred method. Personally, I like to keep the innards and use them for a number of table offerings: gravy bits, pate, to name just a few. So, leaving my pheasants, ducks and waterfowl whole is not an option. The problem is that birds can dry out in the process of them hanging with an empty body cavity. Shaw offered a remedy: stuff a paper towel in place of the organs. It worked fine. So what’s my method for aging pheasants and ducks and geese for that matter? Simply pluck some feathers around the vent. With the bird on its back, make a small slit above the vent, parallel to the outstretched wings. Just under the point of the breast bone is perfect. Reach in with two to three fingers and draw out the intestines, gizzard, heart, coagulated blood, etc. Wash off the heart, liver and gizzard. The gizzard is my favorite for gravy, also quick grilling. After washing it off, slit it down the middle and remove the tough inner skin that is all calloused by months or years of grinding gravel to digest grain. Trim all that might be green from the gizzard fluids. Wash it again after you’ve removed all suggested: inner skins, gravel and grain. Pay special attention to the gall bladder attached to the liver. It’s dark in color. The dark black or green comes from the bile inside. If that touches any meat or the livers, it’s ruined. Cut it away while making sure to not contaminate your fingers. With heart, trimed liver and gizzard, washed, put them in a Ziploc bag to place on ice. They’ll go in the freezer for another day. Wash out the inside of the bird and wipe it out a couple times with paper towel. Then, place one or two paper towels in the empty cavity, doing your best to keep any outside materials like dirt, dust or feathers coming in along with the stuffed paper towels. Shaw has created a nice regulated aging box out of his wine refrigerator. I like to just hang my birds by their feet from a nail in one of the rafters in the cool open area of my garage. Depending on the air temperature, I’ll hang my birds between one to three days. Pheasants hanging in the garage. I prefer my birds lightly aged as I’m doing it more for the tenderizing of the meat and helping the birds best retain its moisture while cooking, which I add to with a one day stay in a brining solution once I’m preparing to cook it. I’ll check the birds everyday to make they’ve not gone over the edge. It’s really just a process of checking the smell. There’s the birdy smell that the pheasant has when it’s freshly killed. Once the bird begins a slight ripening, I’ll immediately pluck the bird, wash it off and then stick it in the refrigerator for at least one or two days. In a Ziploc they’ll last for up to 7 months with no problem. If you want to keep them for up to a year and a half, sink them in water in a Ziploc and the ice will keep them from getting freezer burn and drying out, just like a wooly mammoth. …Hank Shaw has been commissioned to write a book–so stay tuned!